Asa Packer, a self-made man, opened the Lehigh Valley Railroad on Sept. 12, 1855 with the idea of transporting coal mined in the mountains of Eastern Pennsylvania to the many markets on the Atlantic seaboard. His plan was to move anthracite coal from the mountains of Carbon County Pennsylvania to the coal chutes in the city of Easton, Pennsylvania. At Easton the coal was loaded into coal chutes which were used to fill coal barges using the Pennsylvania Canal which ran from Easton to Philadelphia, Pennsylvania. Directly across the Delaware River from Easton is Phillipsburg, New Jersey. Phillipsburg was a hub for both the New Jersey Railroad, and the Morris Canal, a canal system in New Jersey. At Phillipsburg the coal cars were transferred to the New Jersey Railroad system and coal was also loaded into barges on the Morris Canal which brought the coal to piers in Jersey City, New Jersey located opposite New York City on the Hudson River. Coal was the main form of heating for residential and commercial building. Coal was used in locomotives which was new mode of transportation at that time. There was also a huge demand for coal by the steamships of various kinds which all used steam engines burning coal for power. Railroads provided fast, efficient transportation of both passengers and freight and made thousands of railroad jobs available to the growing populations in the east. At the town of Burlington, Mahoning Township, Pennsylvania, Asa Packer purchased 47 acres of land in 1863 for a rail yard to expand operations for his Lehigh Valley Railroad. The town of Burlington was renamed Packerton and the rail yard was named Packerton Yards. This area is located between the towns of Jim Thorpe (formally Mauch Chunk) and Lehighton with the Lehigh River as its eastern border. Packer wanted this location to serve as his headquarters for “all coal passing east”. Packer’s Lehigh Valley Railroad built a large rail and switching yard which had turntables to turn locomotives to specific tracks, coal car building shops, engine and car repair shops, an engine house for twenty-nine engines, warehouses, and switching yards. Asa Packer became very wealthy from his railroad and other enterprises. He was also one of the founders of the Bethlehem Iron and Rolling Mills which later changed its name to Bethlehem Steel in 1899. In 1865 he donated land and money for the Lehigh University at Bethlehem Pennsylvania, presently one of the best engineering universities in America. His rail line continued expanding for years until the slow demise of the Railroad Industry began in the 1950’s. Sometime after 1953 Packerton Yards, which handled mostly coal shipping was no longer used. All the buildings became dilapidated and were eventually torn down, except for one. The last surviving building of the Packerton Yards, the subject of this study, is sometimes listed as a “Coal car repair” shop. In other mentions it is listed as a warehouse. I found no indication, from markings on the floors of this building, or extra supporting features, etc. 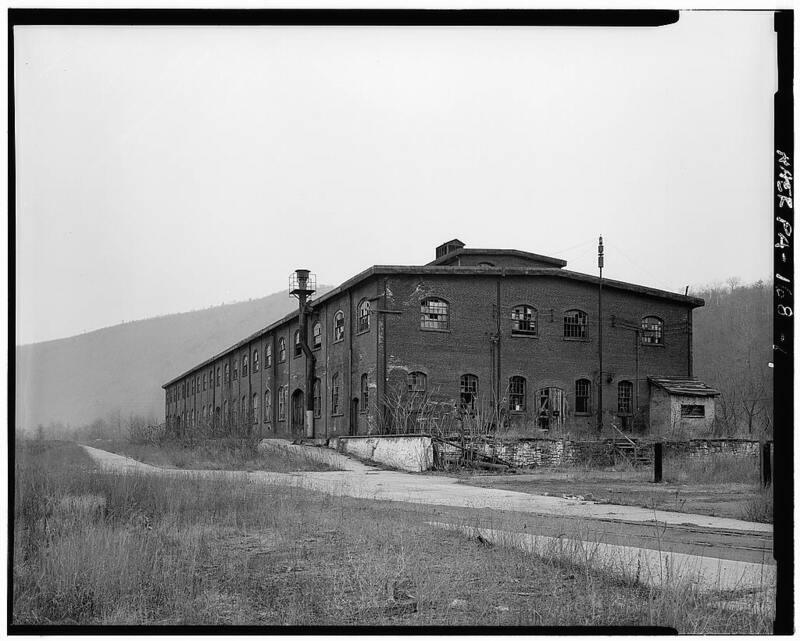 that this building once housed machinery large enough to repair coal cars or engines. There are no standard railroad tracks leading into the building since it is elevated sixty-four inches above the common ground level. I concluded this building must have been used as a parts warehouse. There was a narrow gauge track, running down the center of the second floor which indicated that rolling platforms were used to move and retrieve items. On the first floor some narrow track exists in various locations but may have been put in later since they are not as well constructed as the track is on the second floor. Years after the building was no longer of use, a company that manufactured mobile homes used part of the rear of the building for that purpose. They made some renovations to the north end wall of the building but they too eventually closed operations. “Structure was used as a storehouse with two or three employees. The information is validated by a Lehigh Valley Railroad track map from 1917. Finding this information confirmed my original analysis regarding this building’s use as a warehouse. This last building at Packerton Yards was abandoned from the late 1950’s till the yard was formally closed March 16, 1973. PHOTO OF THE LAST BUILDING STANDING AT PACKERTON YARDS. Construction on this building was started in 1899 and was completed by 1905. The buildings two floors combined equaled 42,000 square feet of usable space. This last building at Packerton Yards was finally demolished in 2007 after surviving for approximately 102 years. At the time when I first noticed this building and took photographs of it, twenty-three years after the above photograph was taken, most of the windows were missing or broken beyond repair, and most of the steel structure was rusted. The plaster coating used over the ceiling fire bricks and walls had fallen from the structure in many places. The following illustrations made from computer models created for this project show how the building was constructed using the new steel technology of that time. It shows the interior walls as brick before they were plastered. The illustrations used in this study make use of various colors to make particular parts more identifiable and to show with better clarity the various parts used in its construction.